While some media hail yesterday’s press conference by the Mormon church as an endorsment of equal rights for gays, closer inspection shows that it is nothing but a strategy shift in the unrelenting Mormon fight against gay rights. 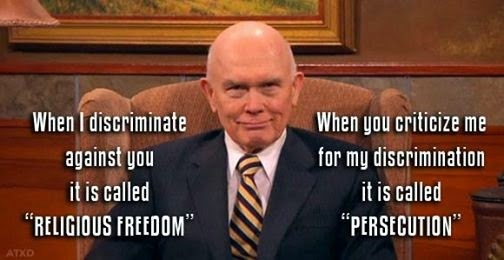 During his statements to the press, church leader Dallin Oaks not only called for LGBT nondiscrimination laws but also for the right to continue discriminating against gays under the guise of religious freedom. That religions have the right to discriminate against gays within their churches is not in dispute. The Mormon church, however, wants to significantly extend this right, as the press conference shows. An internet meme that appeared on Facebook not long after the Mormon church's January 27, 2015 press conference on gay rights and religious persecution. For starters, church leaders want to silence critics because they feel that criticizing their position is a form of religious discrimination. Oaks offered the 2008 “Proposition 8” campaign as an example. Prop 8, as it became known, was a ballot proposal to define marriage in California exclusively as a union between a man and a woman. From its headquarters in Utah, the Mormon church directed its members to spend millions of dollars on this campaign, which led to the adoption of the measure by a narrow margin. The Mormon church received a lot of criticism for its involvement in the Prop 8, as did individual Mormon proponents. Former Olympic gold medalist Peter Vidmar, for instance, who donated to the campaign, was asked to step down as head of the US delegation to the 2012 London Olympics. According to Oaks, this is discrimination. Another thing that stood out at the press conference was that Mormon church leaders only seem to be in favour of limited gay rights in “housing, employment and public services”. The problem for the Mormon church, however, is that it doesn’t really want those either. The Mormon church is actually a large conglomerate of corporations. One of its main activities is commercial real estate and upscale housing development. Moreover, the Mormon business empire offers employment to thousands of people throughout its dozens of businesses. Although church leaders were very clear during their press statement about the limited rights they are willing to concede to gays – “housing and employment” were mentioned half a dozen times – they remained vague on the scope of the rights and freedoms they claim for themselves. Yesterday’s announcement, then, does not bring to an end the decades-long political battle of the Mormon church against gay rights. It has lost this battle with the US Supreme Court about to rule in favour of gay marriage in a few weeks. For that reason, the Mormon church now moves the fight to the legal arena, where it will, in all likelihood, again engage in prolonged litigation against the employees and customers of its many businesses, who want nothing more than equal treatment under the law. The pockets of the Mormon church are deep and its legal department is strong, as are the Mormon leaders’ feelings about homosexuality.